In the past week the so-called Chief Rabbi of the so-called State of "Israel", Yona Metzger, has made vicious and provocative statements asserting that the Palestinians living in Gaza should be moved from their homes into the Sinai desert. Yona Metzger is not an authentic Torah authority, despite the fact that he carries the so-called title of "Chief Rabbi". Chief rabbis of the Zionist State only carry legitimacy in the eyes of Zionist Jews. His status as a chief rabbi is not unlike the leadership of Theodor Herzl, who also wore a beard! The State of "Israel" is illegitimate according to the Torah teachings. The founding of the State of "Israel" is in direct contradiction to the teachings of the Torah which forbids the establishment of a Jewish state and commands Jews to remain in exile until released from that exile by G-d Himself, without any human intervention, at which time all nations of the world will live together in peace. We are likewise forbidden to rebel against any nation. We are to remain peaceful and loyal citizens, in every country in which we reside. Therefore to oppress the Palestinian people, harm them, steal their land, expel them, etc. is totally forbidden according to our Holy Torah. 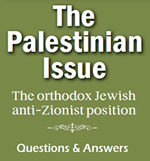 The Rabbinical authorities universally have stood in vehement opposition to the ideology of Zionism and have opposed the state of "Israel" from its creation until the present day. Palestinians have an inherent right to return to their land in historic Palestine and to establish their independent state in the entire Holy Land, which was forcefully taken from them by the Zionists. Indeed, many Gazans are refugees who were expelled from other areas of Palestine by the Zionists ever since 1948. Chief Rabbis of the Zionist state, whether Metzger or anyone else, are merely very well-paid stooges of the Zionists and serve their Zionist masters without regard for the welfare of the Jewish People, the Palestinians, or any other nation in the world. The Chief Rabbinate of the Zionist State, just as all Zionist institutions, has importance only because of its coercive power	over the religious, economic and everyday life of the Jewish residents of Zionist occupied Palestine. Whoever recognizes and supports the Zionist State, even innocently, has been taken over by the heretical Zionist movement, no matter how large the halo that it is granted by supposed Jewish authorities. Chief Rabbis, and other rabbis who support the existence of the Zionist state, are wicked emissaries of evil. Such "rabbis" promote hatred and war, and use their coercive powers to demand subservience of Jews to the Zionist enterprise. This description that we posit of such people has been the long-standing position of authentic rabbis for the last century. Yona Metzger expresses feelings of inhumanity which originates in his loyalty to the cult of Zionism and is perfectly prepared to sacrifice Jewish lives on the altar of his idolatry, the State of "Israel." Any moral person would much prefer to see the Zionist warmongers, including Metzger, removed from the Holy Land. METZGER AND ALL ZIONIST RABBIS DO NOT REPRESENT THE JEWISH RELIGION. We urgently appeal to the leaders of the world nations, especially the great powers, to stop supporting the Zionist regime. Many nations believe that supporting Zionism shows friendship to the Jewish People. This is incorrect! True friendship to the Jewish People can be demonstrated by saving all the peoples of the Middle East, including Jews, from the bloodthirsty machinations of the dangerous State of "Israel" and by dismantling the Zionist regime entirely, peacefully and speedily in our day. May Almighty G-d protect us from the influence of Zionism in general, their evil warmongering bloodthirsty leaders, and from their wicked servants who call themselves "rabbis."